Very unusual Ashtead teapot - 4½" (114 mm) high, 7¼" (184 mm) long. 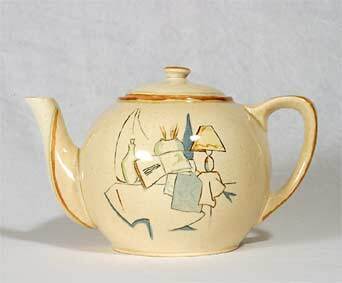 This teapot is undoubtedly Ashtead, from the Pearl Barley glaze, the lining work and the model number 'X14' impressed in the base, but it has no other mark and is of a design that no-one seems able to identify. Ashtead Potters Ltd were active in Ashtead, Surrey between 1923 and 1935. It was set up by Sir Lawrence Weaver to provide employment for disabled ex-servicemen. The work of several prominent designers was employed, most notable, perhaps, being Phoebe Stabler of Carter, Stabler and Adams. Queen Elizabeth II was given an Ashtead 'Christopher Robin' set when her parents visited the pottery in1928. The factory closed, as a combined result of Sir Lawrence's death and the great depression, in 1935. If you find yourself in or near the charming little town of Leatherhead in Surrey, as we did on a fine July morning, the Leatherhead Museum of Local History in Church Street is worth a visit. They have a nicely catalogued collection of Ashtead pottery on display along with many other interesting exhibits.